So my family and I are on our way to the hometown. It's 6.44 in the morning and we're already passed half of the trip. And, let me introduce you to my muse(s). 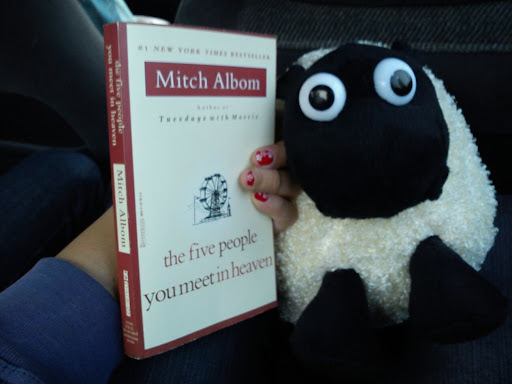 The book, it has no name but it's titled The Five People You Meet In Heaven. It's written by Mitch Albom, my fave writer. It's about an (ex) US Army, Eddie, who's working at Ruby Pier, a wonderful amusement park. Eddie works there as an engineer. He fixes the races and rides if there's anything not going properly well. Someday, at his 83rd birthday, Eddie got his 'birthday present': a broken ride with people stuck in there. One of them is the little girl he always used to meet, to help her get in to any rides she wants to. Eddie gets there to help the little girl, but there's a mistake and Eddie....died. Without knowing if he saves the little girl or not. Eddie is now in heaven. At his new 'journey', he'll be meeting 5 people that was related to his previous life on earth. So far, I've read til' the third person. The book is very great. I love it so much. I always love how Papa Albom writes. He makes me fall in love with his witty-yet-smart-and-heart-touching mind. And my other muse, is a sheep-shaped-fluffy thing commonly called by Shirley Shaun The Sheep. But I name it Daniel Craig. The reason is, I really love Daniel Craig so that I can tweet "I'm sleeping with Daniel Craig". In fact, I'm sleeping with this fluffy sheep. Again, I brought Daniel Craig in my trip because I need an extra pillow to sleep everywhere I want. It's comfy, you know. So that's the post. I'm hungry anyway. Anyone cares to feed me breakfast? French toast would be much appreciated. No? Ah-kay. Well, this is the end of the post. Am starting to get headache because I'm writing this using my phone in the car with lack of sleep. Yeah, expect how dizzy I am. Have a nice Thursday, people!